If the Olympic movement is away from naked wrestlers to nearly naked volleyball players, who am I to complain? Still, wrestling is the original olympic sport. What will be the IOC’s next move – drop the marathon for stock car racing? The International Olympic Committee is the only body dictatorial enough to unite America and Iran against it. It deserves a seat on the UN Human Rights Council. 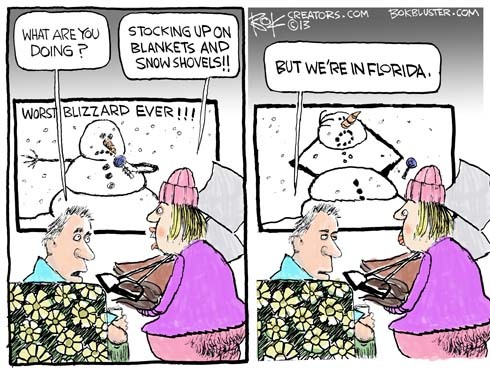 It’s snowing on the mainstream media. In “potentially historic” proportions. Ever since The Weather Channel started naming snowstorms I knew we were in trouble. 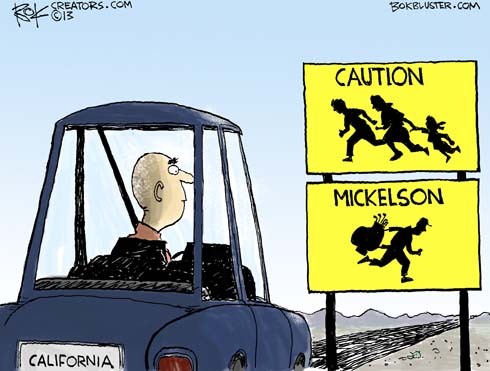 While Congress debated how to keep out illegal immigrants, Phil Mickelson had the temerity to suggest he might immigrate the other way. The reason – his 60% total tax bill. In the ensuing uproar over his greedy desire to keep more of his money, he caved, and also apologized for having kept his opinions. 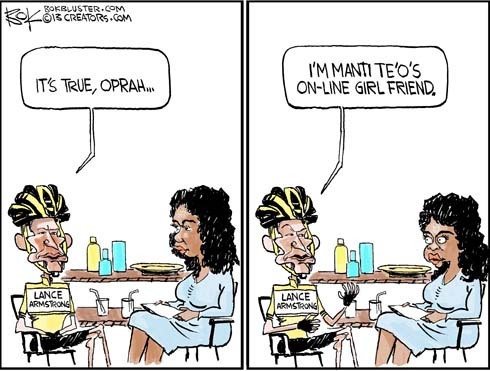 In the Weird Weird World of sports, Lance Armstrong’s doping confession to Oprah Winfrey was upstaged by news of Notre Dame star Manti Te’o’s cyber girlfriend. The fake girlfriend didn’t make Manti run faster but she played the media sob story machine like a fiddle. Lesson: trust somebody you can touch without a keyboard. Here’s a good piece by John Kass reminding ESPN, Sports Illustrated, etc. that “if you mother tells you she loves you, check it out”. Al Gore sold Current TV to Al Jazeera last week. Al Jazeera is funded by Qatar, an oil kingdom flush with black gold. 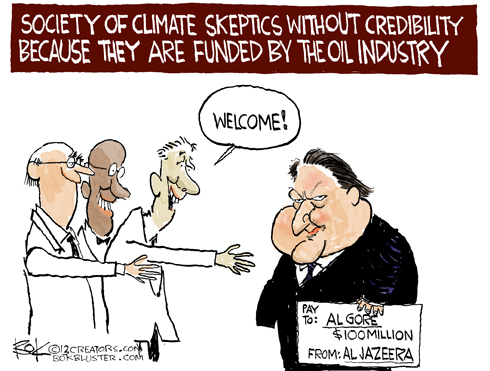 Global Warming believers are fond of accusing deniers of being funded by the oil industry. So when the believers’ true prophet, Al Gore, took a $100 million profit on the sale of Current TV to Al Jazeera it made for an easy cartoon lay-up.